Lori is looking for the BLUE version of this rabbit. 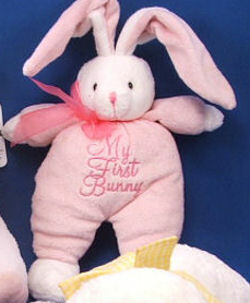 I am looking for a replacement for my son’s bunny that our puppy chewed! He received it from his grandma and has slept with it every night since he was 2 months old and misses it desperately. 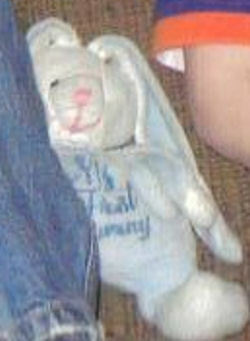 I am looking for a DanDee COLLECTOR’S CHOICE white rabbit with blue ears and white hands and feet. It is wearing a BLUE sleeper embroidered MY FIRST BUNNY on the chest. I have searched countless websites to no avail and am hoping you can help! No problem. I confused things putting the pink photo, but it was so much clearer than Lori’s. I edited the post a little to make the BLUE more prominent. Know it has been some time. If you are still looking, hope this helps.